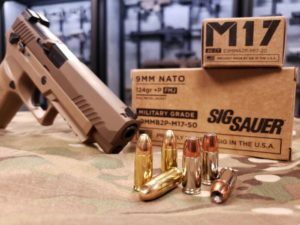 SIG SAUER, Inc. is pleased to introduce the newest addition to the SIG SAUER Elite Ammunition product line – the high-performance M17 9mm +P ammunition. 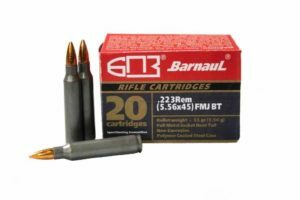 This military-grade ammunition is available in 124gr SIG Elite V-Crown Jacketed Hollow Point (JHP) personal defense loads, and SIG Elite Full Metal Jacket (FMJ) training loads. SIG M17 ammunition is specifically engineered for exceptional performance in any 9mm +P rated pistol, including the SIG P320-M17. Both loads have a muzzle velocity of 1,198 fps and muzzle energy of 395 ft.-lbs. SIG V-Crown ammunition features a stacked hollow point cavity, to deliver exceptional on-target energy with maximum weight retention and expansion for the ultimate stopping power. SIG FMJ training ammunition is engineered to match SIG V-Crown ballistics for a more seamless transition from training to carry ammunition and features durable, copper jacketed bullets offering the perfect combination of affordability and performance. The SIG SAUER M17 V-Crown and FMJ Ammunition is now available for purchase at the www.sigsauer.com/store. Federal Ammunition was recently awarded a major contract from the U.S. Immigration and Customs Enforcement (ICE). Starting delivery in 2019, the multi-agency contract (MAC) provides for up to $75 million of .223 Rem duty ammunition to multiple Department of Homeland Security law enforcement components and other federal agencies for up to five (5) years. This contract will provide the organization’s agents and officers with .223 Rem duty and training ammunition. Federal Tactical is a trusted partner for some of the most intense conditions encountered by law enforcement. It achieves accuracy and terminal performance that defeats tough barriers with minimal deviation. 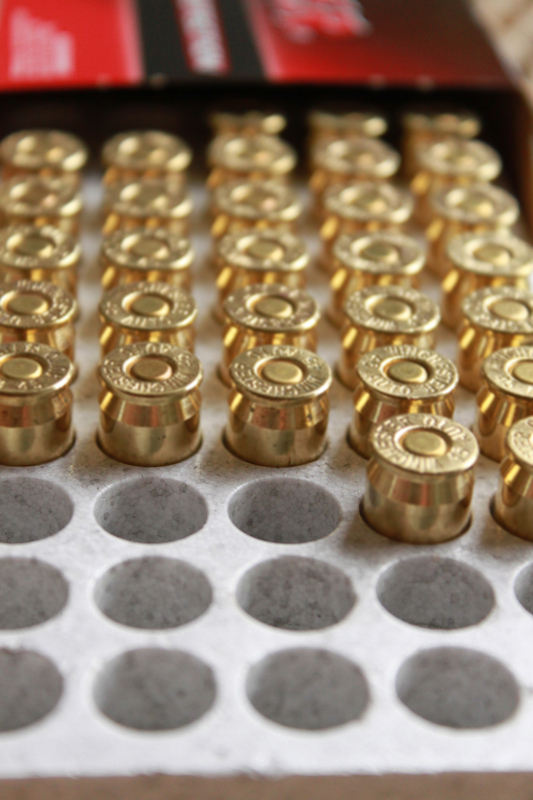 The ammunition utilizes the highest quality Federal brass, projectiles and primers. Service to training, full-autos to patrol rifles, Federal Tactical offers outstanding technical performance and value. ICE, which was created in 2003, is tasked with promoting homeland security and safety, as well as enforcing federal laws governing border control, immigration, customs and trade. The agency has more than 20,000 employees in more than 400 stateside offices and 46 foreign countries. Its annual budget is roughly $6 billion. ICE executes its mission through the enforcement of more than 400 federal statutes, and focuses on immigration enforcement, terrorism prevention and combating the illegal movement of people and trade. Federal Ammunition – is a brand of Vista Outdoor Inc., an outdoor sports and recreation company. For more information on Federal ammunition, go to www.federalpremium.com.